Conservatism has always opposed innovation, resistance to change is one of their bedrock principles. I recognize your point, but then you have to conclude that the modern version of conservatism is opposed to capitalism. How can I say that you ask. Because I have watched conservatives on this thread cheer at the troubles of Tesla. Because I have watched conservatives treat the efforts to create the next sources of energy as a farce rather than as the basis of economic renewal. Because opposition to change has morphed into festishizing the economy as it is and mocking the notion of innovation… All the “How could there be a plane?” or “How can I take a train to Hawaii” posts. Capitalism thrives on innovation and treating innovation as a form of political opposition, that is opposition to capitalism. The Democratic Socialists around here seem more committed to capitalism than the Trump supporters. I don’t mean who says “I’m a capitalist”. I mean who acts like it! Except that capitalism does not require innovation. Its helped greatly by it but its not necessary for capitalism to exist. The reason capitalism won the Cold War was the inability of the Communist system to keep up with innovation both economically and militarily. Yes, capitalism is associated with private ownership of land and means of production, but you have the same thing under feudalism. The engine of wealth creation (and wealth creation is capitalism’s greatest quality) is innovation. And if I needed a back-up argument I would point out that the populist anti-free trade elements of the Trump movement are also anti-capitalist. Globalization was pushed by corporate executives, not by the labor unions. I am distinguishing the “conservatism” of talk radio, and the Trump Republican Party from more traditional conservatism, which of course, closely aligned with capitalism. Does she have a viable replacement or she just full of it? Or is she an idiot with a big mouth and no viable plan to back up her big mouth? In ten years she is going to have every home in America using solar or wind. Whos going to pay for it? In ten years she is going to have everyone in America using rail. Where is she going to come up with the money to lay all the track in heavy populated areas let alone rural areas in ten years? In ten years she is going to have all farmers and construction companies using electric equipment which hasn’t even been designed yet. How is she going to build all that rail track if we can’t use diesel powered equipment? And everyone is going to get pretty hungry when farmers have to use horses again to plant crops. That’s if they aren’t banned like cows because they have gas.
. But you don’t hear her writing up the big plan on how she is going to achieve her pipe dream. Like I said an idiot with a big mouth and an even big ego. Who can’t put her money where her mouth is. That post sounds like something out of a Pogo comic strip. She actually has come up with a plan. Not one that the GOP apparently is jumping all up and down for, but she has. Must be big corporate farmers. Because the local family owned farms I know and I live in the middle of farm country no one travels to Disneyland let alone Hawaii on subsidy cheese money. She has a list of what she wants. I have not seen anywhere where you has said how she is going to achieve this pipe dream. I can say well I want to end world hunger. Nice though isn’t it. But I’m never going to end world hunger by writing in on a piece of paper. I would have to have a concrete plan and implement it to get anything done. It’s a set of goals. She’s taking aim. Is it too lofty? Maybe, maybe not. But it’s better to have goals that do absolutely nothing. And she’s pushing off. Good. The link below has a copy of her resolution, fyi. The plan is massively ambitious and faces political blockades. Proponents believe it is what's necessary to start saving the world from the threat of climate change and to reshape the U.S. economy. Not at all. Are you for grounding all airplanes in ten years if there’s not a viable replacement? In her plan it calls for upgrading every building in the US. That’s feasible? In ten years? Nobody is calling for grounding airplanes, ever. You should read the plan that scares you so much. Can I get to Europe on a train? Show me where that’s in the plan. The above quote is from an overview FAQ sent out by Ocasio-Cortez’s office, not the proposal itself. So it was AOC detailing her goal. I take her at her word. Show me where she said there will be no planes or you have to take a train to Europe. Why would you want to go to Europe? As soon as you arrive you would be taken into custody by the Islamic extremists who have taken over all those failed socialist states. Haven’t you heard its a 'no-go" zone? And I said any of that when, exactly? 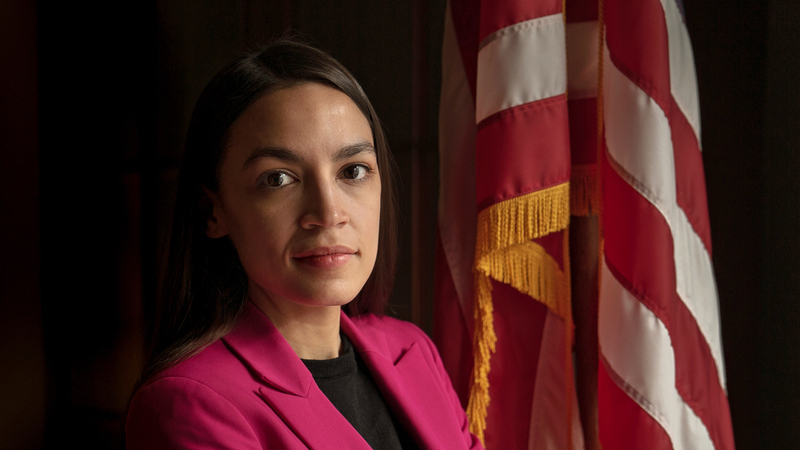 Of course you didn’t… any more than AOC proposed ending all air travel. If you ware going to turn this into a discussion fo ridiculous assertions, expect to be treated in kind. If you provide a serious response, I can assure you that I will give you a serious answer. The picture on the left is far more accurate of AOC which means Always Off Center!! Am I intrigued with her? Heck NO! Do I think what she is espousing is accurate? HECK NO! Do I feel that she makes intelligent comments? ABSOLUTELY NOT!! Would the country be better off without her and Omar? ABSOLUTELY!! !